Kits that are fun to stitch, and provide games when complete. This new series aims at providing pleasure for the stitcher, and pleasure for others once the work is complete. The “Wars of the Roses” cross-stitch kit by Meg Evershed allows you to make a stunning 3-D game board complete with 24 white and red rose playing pieces. 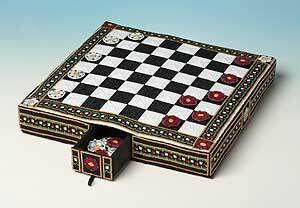 When complete the board is fully 3-D and includes a drawer in which to store the playing pieces. Only 200 of these kits will ever be made, and each kit comes with a numbered certificate signed by Meg Evershed. The games board when complete is 25cm square and 4cm high.